DAVID MONTGOMERY, CA, CHE, CHRP, C.Dir. 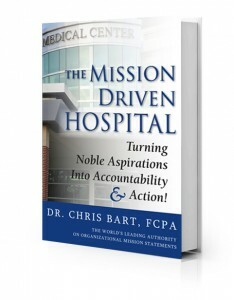 “Bart’s book is written for hospital leaders but relevant to all organiza¬tions within the broader healthcare sector. If you are ready to embark on developing or renewing your strategic plan – Bart’s book will provide you with the step-by-step and readily applied guidance to develop a winning mission for your organization. In fact, Dr. Bart’s book recently helped me to lead my own team through an effective strategic planning renewal process which will make us truly become mission-driven. LORRI LOWE, CMA, FCMA, C.DIR. This book should be on every hospital board’s and senior manage¬ment team’s “must read” list as they embark on their hospital stra-tegic plan. It is an excellent resource with the potential to have a positive lasting impact in the healthcare sector. With one “ah ha” moment after another, this book is exciting and inspirational. The reader wants to get right to work analyzing and improving their own hospital mission statement. Through the use of real life examples and referencing his own very extensive research, Dr. Bart has created a tool that will serve hospitals well into the future. BARBARA LESLIE, DVM, MSc, CAE, C.Dir. ERIC FONBERG MD MPH MBA CCFP(EM) C.Dir. “This is a practical and inspiring book. Chris Bart’s message is clear: “mission-driven” hospitals outperform other health care providers on virtually every measure. He has written a practical step-by-step guide that carefully explains how hospitals can make their mission the heart of all that they do, and why this is so essential. This book should be mandatory reading for every CEO and Board Chair in the Canadian health sector today.